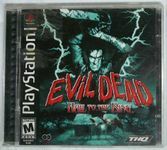 Evil Dead: Hail to the King is a survival horror game for the PlayStation and Dreamcast video game consoles. Eight years after his adventures in the Army of Darkness movie, Ashley "Ash" Williams finds himself haunted by nightmares of deadites. With new girl and fellow "S-Mart" employee Jenny, Ash must return to the cabin from the original Evil Dead and confront his past. Unfortunately, Ash's evil amputated hand plays Professor Raymond Knowby's cassette tape and once again reawakens the evil in the woods. Jenny is taken, and Ash's evil twin breaks out of the mirror. Armed with his axe, his chainsaw, and his trusty "boomstick", only Ash can find the missing pages of the Necronomicon Ex-Mortis and banish the evil forever.